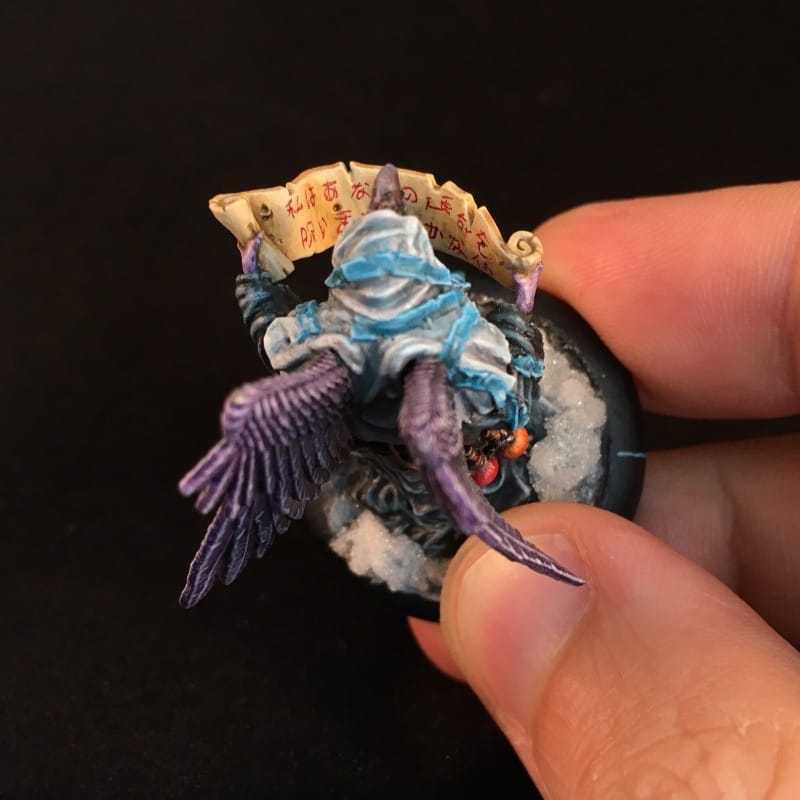 Let's start with a Tengu mini that I finished about 6 weeks ago. Unlike my other bright birds of prey, Sanjakubo is a darker looking miniature that reminds me a bit of the Skeksis from The Dark Crystal. As he is the Tengu's dark sorcerer, that fits quite nicely. 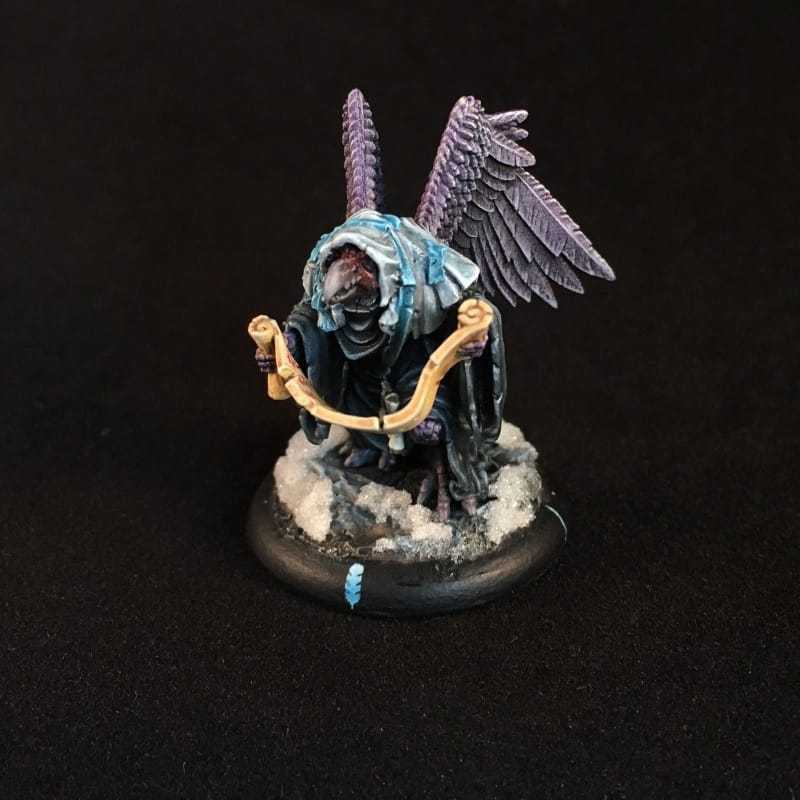 I wanted to paint him a bit like a crow... but I'd already decided dark black robes and thought black wings would be a bit too monochrome for my tastes, so instead he received some dark purple-black plumage. I tried a few different phrases, but as one of his spells in the game is "Curse Fate", I ended up plugging "I curse your fate foolish samurai" into Google translate to see what the kanji would look like. That seemed about the right length so I set about painting some tiny Japanese calligraphy. The beauty of this is that if it's wrong or poorly written, gaijin that I am, I'll never know! I had to post that lyric as it has been bouncing around my head since I added the Minstrel to the gallery! This is an older piece that I completed last year. It's currently one of the only 2 minis I've painted at the larger 54mm scale (the other being Sumothay) but I really enjoyed this one. I've said before that it does get a little old painting swords and guns on everything, so a lute and glass of wine was a welcome change. For ambience, I also sculpted the barrel, cloth and wine jug out of milliput and green stuff. 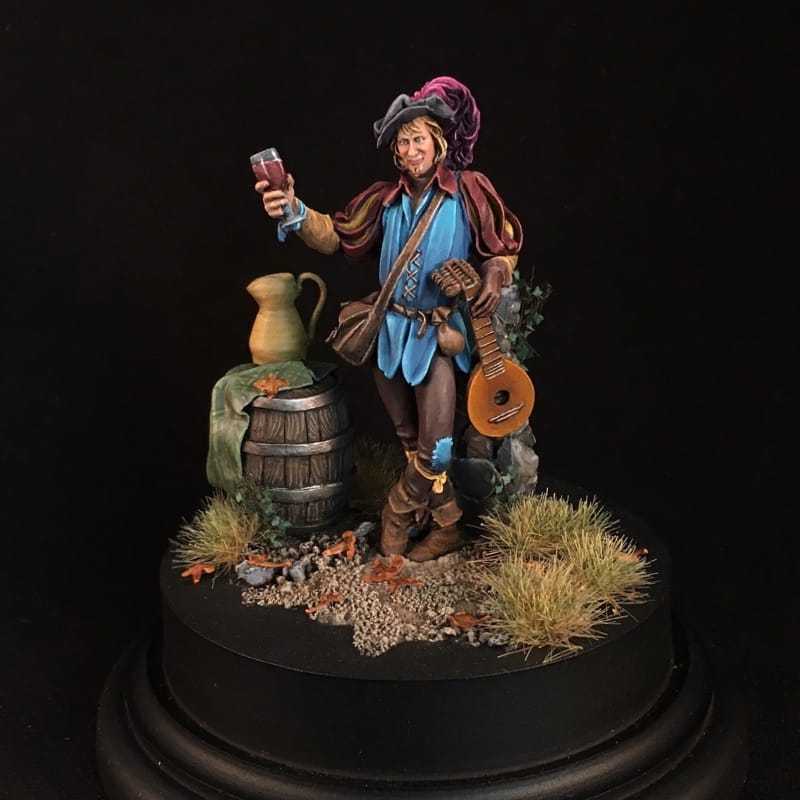 I don't do a lot of custom sculpting like this, but it's always a lot of fun and I think it nicely completes the scene: the traveling minstrel taking a break from playing with his wine jug just outside the tavern. Last, but very far from least is Tinker Belle from Guild of Harmony. She's the fourth Guild of Harmony sculpt that I've painted (Ariel is currently on the site, but the other two have yet to be photographed). After painting a lot of Bushido minis that, while beautiful sculpts, don't quite have the insane level of detail that the Guild of Harmony miniatures do, I was a little trepidatious about this one. However, after jumping in I really grew to love painting little Tink. There are several other nice versions of Tink on various sites that have used some different color schemes, but for my version I wanted to stick with the classic greens that Tink is famous for. Plus, with two little girls at home, I don't think they would have let me get away with too much creative license - the mechanical arm is quite enough!. I did try to give her a jolt of color with a pink wrench, but it didn't quite work out, drawing way too much visual attention away from Ms. Belle herself. 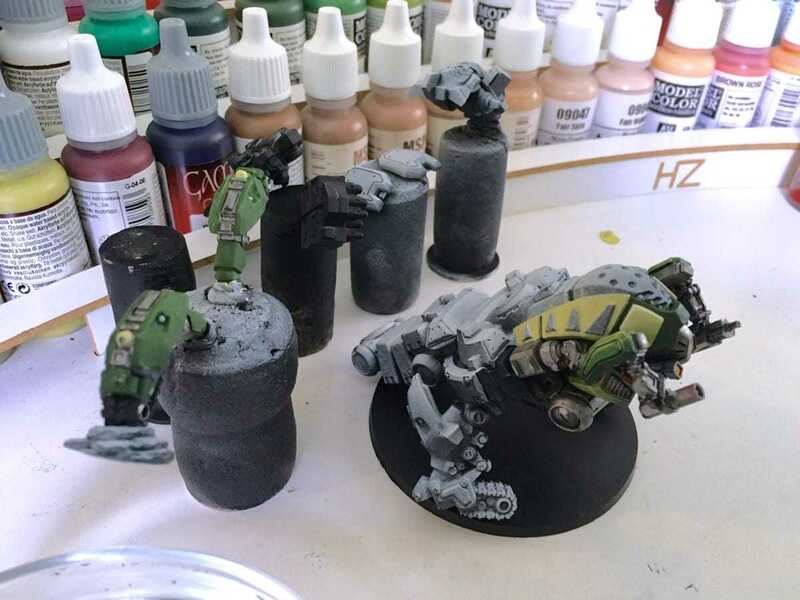 Currently sitting on my painting table and taking up a rather large number of corks, is my next piece: the Maghariba Guard for my Haqqislam army for Infinity. I've been eagerly waiting for this beast to be released ever since I saw the early digital renders and I'm very happy to now have the opportunity to get some paint on her. Aside from being a rather large (and heavy!) piece, it's fun to change things up and work on something purely mechanical. 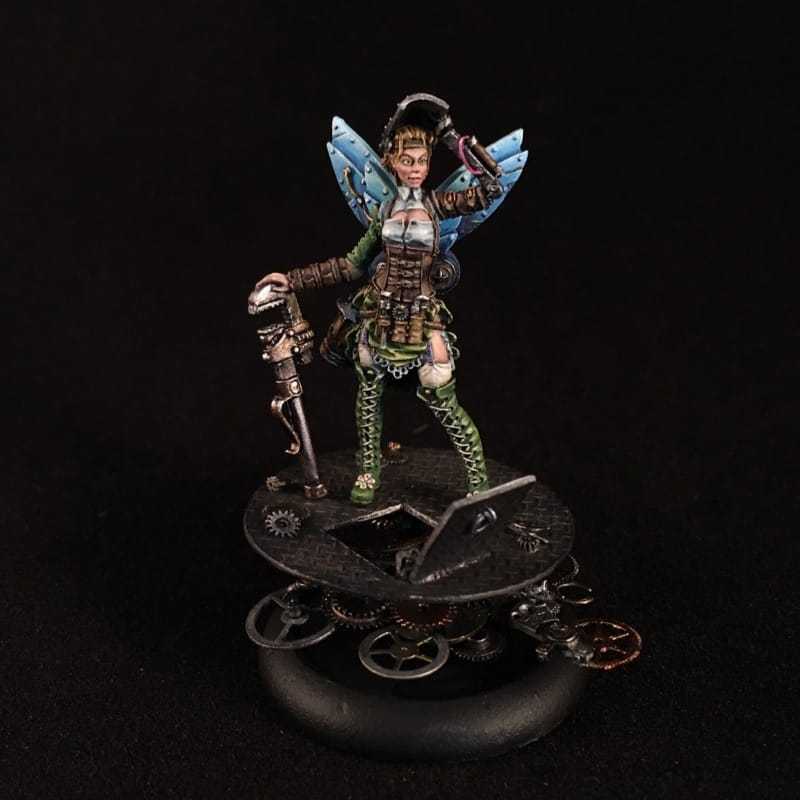 After Maggie, I just picked up my first Guild Ball mini (Bill the Butcher.... erm, I mean... "Rage"), Oda and Tautola for my Silvermoon Syndicate in Bushido and I have another steampunk lass, Florence Nightingale by Patrick Masson, for the Twisted range that I'm eager to begin. So much lovely little resin and metal!